An Indian medical tradition dating back to the 1st century B.C. Ayurveda always seemed to me to be to be a bit like horoscopes – you have your doshas (type of person). And your dosha describes your body type, temperament, personality, sleeping habits, what you should eat, etc….and then treatments are geared around your dosha. Given that there are 3 doshas it seemed simplistically convenient that everyone fit into one type or another. I loved the idea of it, but struggled to make it work in my logicial, Western mind. However, recently I spent some time undertaking Asian Holistic Therapies at Kamalaya Koh Samui and revised my previous skepticism of Ayurveda. Ruby the lead practioner of Ayurveda at Kamalaya explained to me that Ayurveda means the “science of life” or sometimes it is also understood as “life is knowledge.” It is an Indian system of holistic, natural medicine and was first described around 3,500 BC in the Vedic texts of ancient India. Ayurveda promotes living a balanced life with the physical, emotional, mental, and spiritual in harmony. Its overarching idea of balance and harmony are not so different than Traditional Chinese Medicine, but it’s the underlying principles on how this manifests in self care that is quite different. First, let’s start with the doshas or types of people. There are 3 doshas that form from the 5 elements – vata which is strongly associated with water and some earth; pitta which is associated with fire and some water; and kapha which is associated with air and space. When the dosha is balanced, the body, mind and spirit are in harmony, but when the dosha is imbalanced this leads to disease. Ruby (who studied Ayurveda in Kerala, India) took my pulse and told me that I was a pitta. This reminded me of the pulse taking in TCM which was also used as a diagnostic tool. She said that as a pitta I had a “strong personality,” was a “natural leader,” “warm and intelligent” and could have bouts of “anger and frustration.” She spoke about how this dosha would then manifest in physical symptoms. Insomnia, check! Digestive problems, check! Headaches, check! Stress Response: Irritable, tendency to blame others. What amazed me about all this, despite the fact that the characteristics are generally true of me, was that my TCM practitioner had very much the same analysis upon meeting me. I was starting to think that there must be something to these ancient regional practices. Actually if you think about it is not wildly different than Western medicine. And in fact I had seen a doctor in a hospital in Singapore with the very same complaints and she had given me the very same diagnosis. How could 3 very different medicine disciplines arrive at the same conclusion? Ruby’s recommendations for me were quite similar to the TCM recommendations as well as the Western medicine recommendation. She basically suggested that I treat the stress and symptoms in the short term, but look at longer term changes in lifestyle to maintain a better sense of balance in my life. 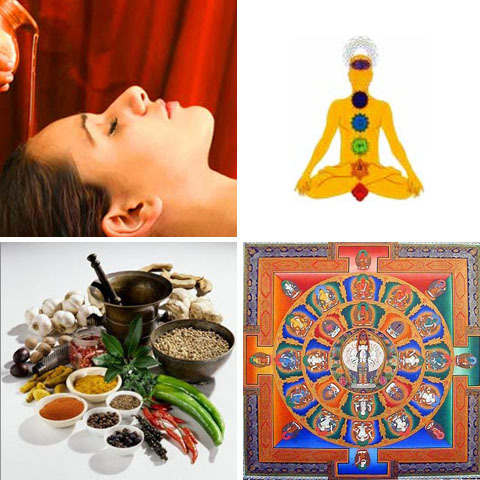 To this end, she several treatments for me to balance my dosha and treat the symptoms of stress with holistic therapies In the short term we employed a combination of Shirodhara, Ayurvedic Massage and Marma Point Therapy. And then for longer term, she recommended yoga, meditation and cooling foods to balance my hot pitta nature. How do I find an Ayurvedia Practitioner? Much like TCM, Ayurveda is becoming more accepted in the West as a complementary or alternative medicine. Studies from the Yale University of Medicine have validated its use while the National Institutes of Health now spends a portion of its significant research budget on Ayurveda. Someone who does Ayurvedic treatments may not necessarily be an Ayurvedic doctor, although this does not mean that benefits can only come from a doctor. A therapist may have just trained in Ayurveda, whereas a doctor would have a Bachelors of Ayurveda, Medicine & Surgery (a 5 ½ year course of study). It includes eighteen different subjects on anatomy including physiology, cadaver dissections, pharmacology, pathology, modern clinical medicine and clinical surgery, pediatrics, along with subjects on Ayurveda like the history and evolution of ayurveda, identification and usage of herbs, and Ayurvedic philosophy in diagnostics and treatment. If you are looking for a therapist outside of India, more than likely you will find one in areas where there are larger Indian communities, e.g. London, Singapore, New York, Bangkok. Look for your national or local Ayurvedic association for a list of certified practitioners and doctors. it is a school of integrative medicine in Singapore – depending on what you are looking for, I am sure they can recommend some local practioners. One of the common philosophies in alternative medicine is to use treatments that aid, facilitate and strengthen the body’s innate healing processes in their efforts to restore health and balance. To work with, rather than against, the self-evident innate healing process, whenever possible, makes sense and has demonstrated countless successes.